A Bill which would alter the requirements for signage for speed cameras has been quietly making it's way through the state legislature and is nearing final passage. 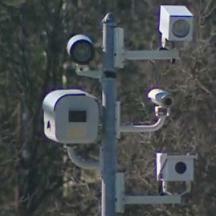 The bill is intended to "fix" a provision of the law which nearly every speed camera program in the state has technically been in violation of. 2. Ensure that each sign that designates a school zone indicates that speed monitoring systems are in use in school zones; [...]"
C. IS IN ACCORDANCE WITH REGULATIONS ADOPTED UNDER SUBSECTION (K) OF THIS SECTION. K. THE STATE HIGHWAY ADMINISTRATION SHALL ADOPT REGULATIONS GOVERNING SIGNS PLACED IN ACCORDANCE WITH SUBSECTION (B)(1)(VII) OF THIS SECTION. " This seemingly insignificant change would not seem to make matters substantially better or worse, and it frankly does not matter to us whether a 'photo enforced' sign appears on the same pole as a 'school zone' sign or next to it. What it DOES do, however, is point out something we mentioned previously: the signage for almost every "school zone" speed camera in the state is in violation of the current wording of state law. In almost every instance, 'photo enforced' signs deployed in school zones(which in many cases were newly created) are not typically installed on the school zone signs, but rather are deployed elsewhere (if the required signs are in fact present at all). It certainly would have been physically possible for these speed camera programs to comply with the wording of the original law by deploying "photo enforced" signs under each school zone sign. And of course many if not most of the school zones were in fact newly created solely for the purpose of deploying cameras, so they could have placed signs anywhere that was appropriate. But somewhere along the way nearly every speed camera program in the state decided they did not need to comply with the wording of the above law, apparently with absolute confidence they'd never need to worry about it in court if they did not. It must be very nice simply being able to ignore, or change, any provision of the law you disagree with. Apparently the same agencies which hang cameras on every street corner to waiting for drivers to make mistakes so they can be fined are able to do exactly that. There is no "enforcement clause" in state law which even requires the court to find the defendants not guilty if the tickets were issued in violation of the law, and no penalty for local governments even if they have violated provisions of the law in a systematic way. District courts have almost universally ignored any arguments by defendants pertaining to signage in speed camera zones, including many reports we have received of locations where there were either no "school zone" signs or "photo enforced". Given that state lawmakers chose to write the law in such a way that most of the restrictions on speed cameras are almost if not entirely unenforcible, it is little surprise that nearly every restriction on the use of speed cameras is being flouted by one or more speed camera programs in the state. The view by camera programs that restrictions in the law are something to be broken, circumvented, or ignored seems to apply not only to technical issues of signage, but also to matters which could affect to the accuracy of cameras, or whether cameras are operated properly, or your right to due process, or create conflicts of interest in the system. So who is responsible for enforcing those restrictions? The answer seems to be *nobody*. Not Maryland courts(which apparently now is OK with a system which finds drivers guilty until proven innocent), not the SHA (who's own scamera program violates provisions of the law), not the Attorney General, nobody. Well nobody except us, and (possibly) you.